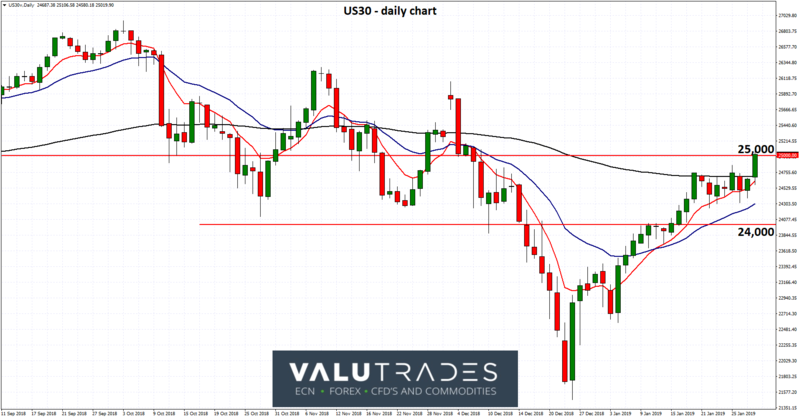 After consolidating for a week or so between the two key levels of 24,000 and 25,000, the US30 index has rallied higher to threaten the resistance at 25,000 and look to push through. In the last month or so, the index has done very well to move back within this range after falling to its lowest levels in 18 months below 21,500. It met some resistance at 24,000 before moving through. Both the 24,000 and 25,000 levels have played a significant role with the index in the last few months and both remain significant. December was several weeks the US30 index would rather forget as it fell very sharply down through any support at the 25,000 level and then also through the 24,000 level down to that 18 month low. As expected the 24,000 level did offer some resistance and it will be interesting to see whether this level props up the index should it decline from its current levels. In late November it enjoyed a healthy surge higher climbing back above the key 25,000 level to above 26,000 before reversing sharply and falling lower. The last few months have seen the index moving sharply between 24,000 and 26,000 as the volatility and the swings back and forth intensified before the massive drops in December which was the most volatile the index has been in many years. For several weeks in September the US30 index had been content to trade within a narrow range near 2018 highs under 26200. The 25000 level has been significant as it has offered lots of resistance and would have come as no surprise when it supported the index back in July and August of last year. In a unanimous decision, the U.S. Federal Reserve (Fed) held interest rates steady at their recent two-day Federal Open Market Committee (FOMC) meeting. In a clear change in policy, the Fed vowed to be patient in any raising of interest rates, which was the clearest signal we have seen that the tightening cycle it began in 2015 may have ended. "The case for raising rates has weakened somewhat," Powell said during a news conference following this week's FOMC meeting. Citing rising uncertainty about the U.S. economic outlook, Fed Chairman Jerome Powell said the case for raising rates had “weakened” and, in a statement, the central bank dropped its earlier expectation for “some further” tightening. “The situation now calls for patience,” he said, referring to the idea of further rate rises. “I think it’s the right thing. I feel strongly that it is.” The Fed raised rates four times last year including in December, when it indicated it would do so twice more this year. As a result of recent volatility in markets and signs that growth is slowing overseas, including in China and the euro zone, the U.S. economic outlook is not looking so rosy. There are also fears the recent U.S. government shutdown may dampen consumer spending. “In light of global economic and financial developments and muted inflation pressures, the committee will be patient” in determining future rate hikes, the Fed’s rate-setting committee said in the policy statement.